And I ain’t gonna fight no more! Makes sense doesn’t it? Being “the abused” makes you constantly feel like giving up and ending everything, only to be stuck back in the thought of “things will get better, I won’t surrender by committing violence to myself ans stooping to his level.” Then I received the Mirror Ball 2 CD set and heard one of the last songs on disc two and discovered the perfect song to define me today. As you know I am determined to heal and no longer allow my past to define me. The song, Undefeated. These lyrics (again, cutting the repeated chorus) are a bit longer, but pay attention, Def Leppard gave me strength. And I am surrounding myself with as much strength as I can, God, people, family, and yes, music. Thank You Def Leppard!!! 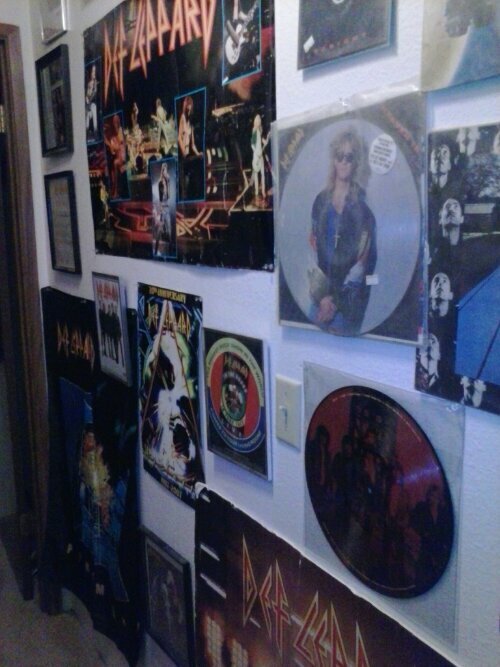 The pictures above are a portion of my Lep collection. 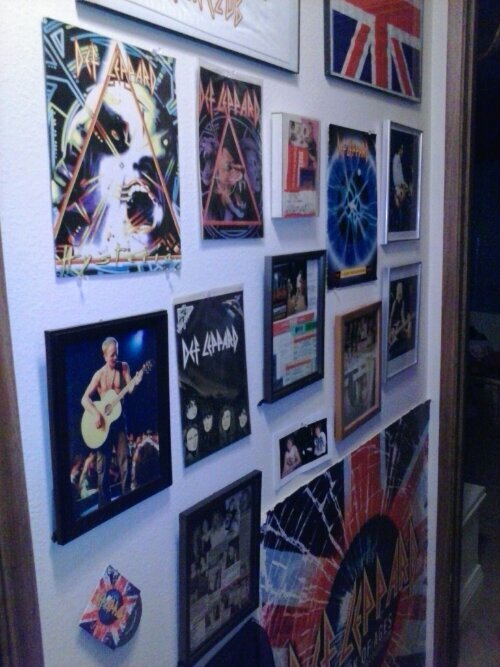 From original posters and prints from the mid 80’s, to the autographs, pics and personal photos of certain members of the band. Yep, during the Adrenalize tour, I met two members. All are original. I survived abuse and you can too. Please know that you are not alone!!! After the temporary pacemaker sta inside me for a few days, they decided to put a permanent pacemaker in me. Before they placed the first one in me, I remember them getting me to sign a paper saying I was going to try something. I had no idea what was going on as I was completely out of it, but signed. After the pacemaker was placed in me, it was described what I signed. To me this was wrong to do to me. But whatever. They placed a pacemaker and leads in me but the signature was for the gel put on the leads to promote quicker adjustment and healing. That all went well and I have never had any trouble with the leads. However, a few years later, I began passing out while driving past certain areas with large satelite dishes and such. Then I started feeling very weak when there were lightening storms. And here’s a funny one. On my mother’s microwave, not any other, I would have to hit start and run because my chest would start feeling like I had bees in it and I would get weak. It was too weird. In 2000, I went in for my usual pacemaker check up and everything was fine, just a few adjustments. The doctor was an hour away. When we got home, there was a message on the machine from the doctor. I called them and they said I need to get back up there fast as the pacemaker in me had been recalled. WHAT THE HECK?! I thought. So of course I went back up and I went into surgery and the pacemaker, not the leads were replaced. While on Guam, I tried to find a doctor to do a pacemaker check up on me and could not find one. Upon calling around, they said that my type of pacemaker required a specific machine that was not available on Guam. I started asking what would happen if mine was dying. They proceeded to tell me to call 911 and they would keep me going on paddles until I get to the operating room wherein they would put in a stent. They would then medi-vac me out to the states to get a new pacemaker that Guam was able to upkeep. This was madness to me. Moving back to the states is actually what I ended up doing. In 2007, Matt was about to quit his job which meant he would lose the insurance on me. So we consulted the doctor. He said that since we were within 6 months of it needing to be changed and the fact that I am pacemaker dependant, that the insurance company should approve me for an early chang out. So I went in again for surgery and they replaced the pacemaker again. This one should technically last until the beginning of 2015. The pacemaker was placed in a more shallow place. As I was bent over cleaning the tub one day, I felt the pacemaker move. It actually turned sideways in my chest. I saw the doctor and he said it is doing just fine. Today, it bothers me sometimes if I have to bend over or reach up high but no big deal. Before I left Wisconsin, I saw my doctor for my check up and they found something abnormal on the machine. What was supposed to be a 30 minute exam turned into a 3 hour exam. They would not let me leave until I had a number of tests done. When I came in for the follow up appointment. The doctor looked shocked. He said the episodes I had been having of the buzzing feeling in my chest was not the pacemaker at all. Apparently, because I am so used t feeling the pacemaker work, when my heart actually beats for itself, I can feel it. I said ok, cool. The doctor said, “did you hear what I said? Your heart is beginning to beat on its own at times.” This was such a shock to me. My body is healing itself. PRAISE GOD! If you have gone through something similar, please know that you are not alone. I have always been a girl with speratic periods, and it never really bothered me. I would sometimes go a year and only have two periods. It was no big deal to me. It was in 2003 when I had a very heavy period that lasted a month long. The bleeding would not stop and I was getting tired more often. I felt like I was buy stock in Kotex. I bled through a tampon and a pad every day. I called the gynecologist and they got me in asap. or her to examine me as I was bleeding but it had to be done to get to the bottom of it. She also ended up doing a vaginal ultrasound on me. She found multiple cysts on my ovaries. This raised a red flag and she performed a biopsy on a cyst. It took a few weeks before I had the results. This was the most grueling time of my life. I was so scared. When the results came back, I went in and she informed my that they were benign. Whew. She told me I have PCOS and the cysts will come and go my whole menustrating life. She put me on birth control to regulate my periods and said there were creams available for the extra facial hair. The only trouble since then, is the fact that I haven’t been able to have any more children. This was heartbreaking, but made me appreciate the son I have. If you have any ideas, let me know. I’m continuing to experience the dreams even after acknowledging them. If you are experiencing the same, I hope these words encourage you. Please know that you are not alone.